Historic Mile 35 Taylor and the Peace River Bridge/1st Main Army Camp 341st Engineers: Before the Peace was bridged in 1943, the ferry from Taylor served as the major link across the river. 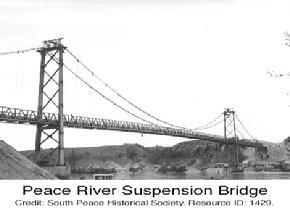 The original Peace River suspension bridge, the longest bridge on the highway, collapsed in 1957. 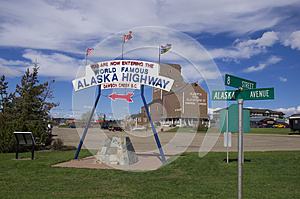 In the late 1940s and early 1950s, as they approached the Peace River in British Columbia motorists on the Alaska Highway would be stunned to see the soaring towers of the original Peace River Bridge. One of two suspension bridges built on the British Columbia section of the highway, the Peace River Bridge, near the town of Taylor, was praised as one of “the great bridges of the Dominion of Canada.” It was constructed by a famous American bridge building company, John A. Roebling’s Sons Company, under contract to the US Public Roads Administration (PRA). The company also built the Brooklyn Bridge and the Niagara Falls Suspension Bridge among many others. 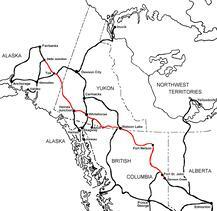 When it opened in 1943 after only nine months of construction, it was the longest bridge on the Alaska Highway, measuring 647 m (2,130 feet) long. One of the highway’s six “special crossings,” it was built to last decades. However, nature, in the form of a landslide, proved to be an unbeatable force. In 1957, 14 years after it opened, this magnificent structure collapsed – its north abutment falling over in the landslide, snapping its steel cabling and smashing the roadbed into pieces.